If you haven’t heard about this yet, don’t get too excited. This is not our Invisible Man. Instead, this will be a sequel to H.G. Wells’ original story that focuses on the British nephew of the original Invisible Man. The story is to be set during World War II. David Goyer will write and direct the film. Well, I don’t think I need to tell you that I think Universal totally missed the boat on this one. They own the rights to our Invisible Man and yet they choose to ignore it and make a film that is a sequel of the original. What a shame. I said that I’d play catch up on the news when I got back from the con, so here’s an item that is about three weeks overdue. Yikes! 1408,a horror film written by Matt Greenberg, as well as Scott Alexander and Larry Karaszewski, has been out at theatres for a few weeks now. I believe it’s still playing in some theatres. So if you want to see this film, there may still be time, but do check your local listings to be sure. A picture of Matt Greenberg attending the world premiere of 1408 can be found here. In related news, the following article, partially quoted from the Los Angeles Times, gives a interesting tale about the writing and rewriting process for this film as well as some insight about screenwriting protocol in Hollywood. It was somewhere around the time that he was in his backyard grilling ribs for Scott Alexander and Larry Karaszewski (“Man on the Moon”) and their families that Matt Greenberg (“Reign of Fire”) realized he had a unique screenwriting circumstance on his hands. Given that Alexander and Karaszewski had replaced him as the writers of the horror film “1408,” a friendly barbecue would have seemed unlikely. As with most screenwriters, all three had been hired for development rewrites before and been rewritten themselves, but none could remember ever becoming so friendly with their ostensible collaborator — at least not during the active rewrite process. But here they were communing over Stephen King and some baby backs. It’s actually supposed to be part of the screenwriters code — tacitly encouraged by the Writers Guild — that when a writer is hired to rewrite someone’s screenplay, he should throw a courtesy call to the previous writer (that is, when it’s not a pile-on with 22 writers, like “Mr. & Mrs. Smith” or “Stuart Little,” in which case most of the involved parties would be happy that you forgot to call them). Then there are the true horror stories of when writers are set up to make the call that inadvertently informs the previous writer that he or she is in fact the previous writer. Greenberg worked on the screenplay, an adaptation of a 20-page King short story about a man terrorized in a spooky hotel room, for a year at Dimension. But after the project lay quiet for a while, the producers told him they were bringing on Alexander and Karaszewski. “These guys really were doing the heavy lifting during production,” says Greenberg, who met with them fairly regularly. “I tried to keep my own ego in check and just recognize that, ‘Look, at this point I’m an informal consultant.’ ” They all eventually agreed over a handshake to a shared screenplay credit, which allowed them to bypass a dreaded guild arbitration hearing. In this rare case, their civility won out over a system designed to provoke competition. “It was really nice that a good relationship came out of it,” Alexander says. “We were all on the same page.” “1408’s” due June 22. Okay, more about the writing of 1408. What can I say? I find the whole screenwriting process absolutely fascinating. So here’s a podcast by Senior Editor Jeff Goldsmith of Creative Screenwriting Magazine. In it he interviews co-writer Matt Greenberg and the co-writing team of Scott Alexander and Larry Karaszewski. Warning: This podcast is almost an hour long and it contains spoilers for the movie. Dear readers, I apologize for the lack of posts lately, but I promise I’ll get back on track and caught up on the news when I get back. But now I’m off to Los Angeles for I-ManiCon 2007 to visit with cast and fans! Feel free to leave comments, but know that I won’t be able to approve them until I get back next week. I wish I didn’t have to moderate the comments, but if I didn’t, spammers would have free reign to post their crap here and I won’t allow that. I meant to get this blog out a few days ago to give everyone enough of a heads up, but life has been insanely busy lately and, yeah, I’m behind on my blogging. I apologize to those of you on digest who won’t see this until tomorrow. Anyhoo, Mike McCafferty has a guest role tonight on Comedy Central’s new show American Body Shop, which is scheduled to air at 10:30 p.m. Pacific/9:30 p.m. Central. Be sure to check your local listings for the time and channel in your area. Originally, Mike had tried out for a series regular role on the show, but it turned into a guest role instead. You can read all about the highs and lows of the audition process for this show from the man himself in this post from his MySpace blog. He may not have landed a series regular role, but he did get his own action figure. 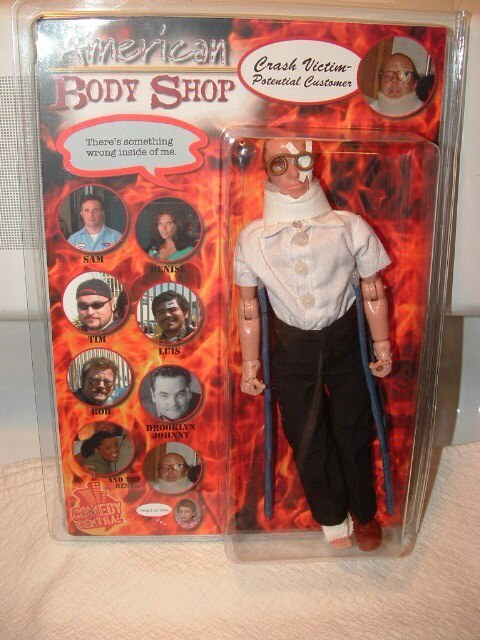 This doll (oops…I mean action figure) cracks me up. Check out the following picture. You can get a sneak peak of Mike in his role as Mansfield in the trailer entitled Peak Under the Hood on the American Body Shop home page. In related news, the story of how Sam Greene, the show’s creator, sold his show idea to Comedy Central is a fascinating one. It’s a story of how sheer tenacity is often needed to make it in Hollywood. According to the Hollywood Reporter, “Greene, who had spent 20 years writing spec material for film and TV but never sold a project…decided to shoot his own pilot, stick it in an envelope and mail it directly to the network powers-that-be.” He was ready to give up when one day he got a call telling him “that Comedy Central wanted to develop his project.” You can read the rest of his story at the Hollywood Reporter website. In another somewhat related story, it would be easy to assume that all working network writers in Hollywood would automatically be members of the WGA (Writers Guild of America) with all the rights and protection such a membership afforded them, right? Wrong. Writers on several Comedy Central shows, which includes American Body Shop, have only recently reached an agreement with the network for WGA contracts. You can read more about this at Variety.com.